Millions of people spend (so to speak) 40 hours a week, 50 weeks a year doing nothing but playing with money -- printing it, minting it, counting it, recounting it, taking it from here, sending it there, juggling it, smuggling it...sitting in offices in huge buildings making phone calls and shuffling bits of paper, adding & re-adding endless columns of numbers to make sure that they come out exactly the same...yeah, but...What is money? 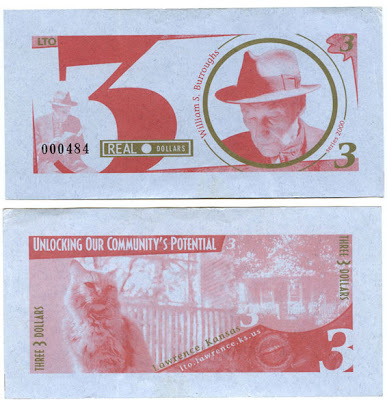 I was cleaning out a drawer yesterday, and found my own unspent three-dollar Burroughs bill neatly squirrelled away. Burroughs was a long-time resident of Lawrence, and incidentally, my neighbor 'across the way'. I lived just on the outskirts of town, where the Kansas countryside was still evident and his little red bungalow faced my kitchen window across a small creek and field. Each night, I would see his figure out on the porch, tending to his cats. I wonder if I can still buy a beer at Free State with his currency.